Sometimes things come across your trading screen that take you in a direction you don’t initially expect. When you see numbers like that, you wouldn’t be surprised to see headlines about the stock popping up on your news feed, and you’d probably expect to see a big move on its price chart. 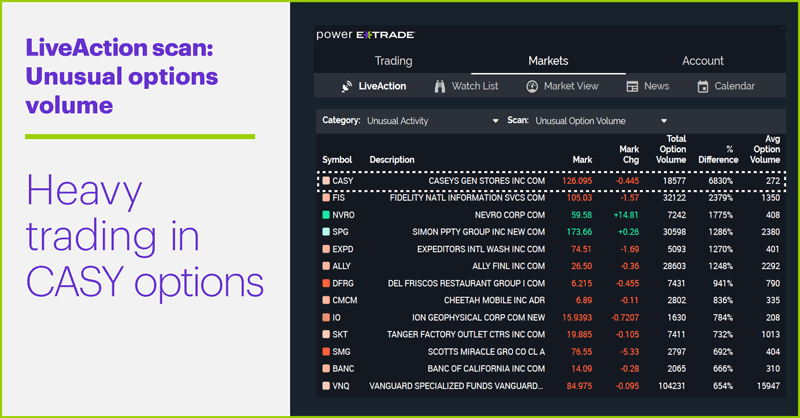 Reviewing the contract-by-contract volume in CASY options showed most of the action was taking place in two April strike prices (calls and puts) nearest to the stock price, but it also showed open interest (the number of unclosed options positions) was relatively low—far below the day’s volume, in fact. That suggests the heavy volume was more about traders liquidating existing trades than putting on new ones. Where does that leave things? 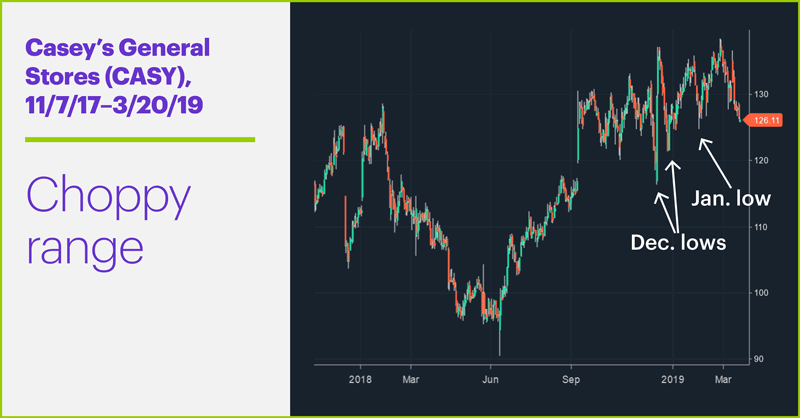 Casey’s reported quarterly numbers on March 11 (topping earnings but missing revenue estimates1), and with that potential catalyst off the table until June, traders may be focusing the momentum of the recent price action. Who knows, maybe some of the options liquidation was traders scaling back long positions in a stock that wasn’t trending, or taking profits on short options for the same reason? Yesterday the stock was knocking on the door of its late-January lows around $125; if that threshold breaks, the December swing lows around $121 and $116 loom below. In the absence of a specific catalyst, some traders may expect the current momentum could take the stock to one or more of these levels before bulls decide prices are low enough for a true upside reversal. Even if big numbers don’t always turn out to be what you think they are at first, they can still alert you to possible trades. Market Mover Update: Levi Strauss & Co. is scheduled to begin trading today under the symbol LEVI, offering more than 36 million shares at a target range of $14–$16.1. 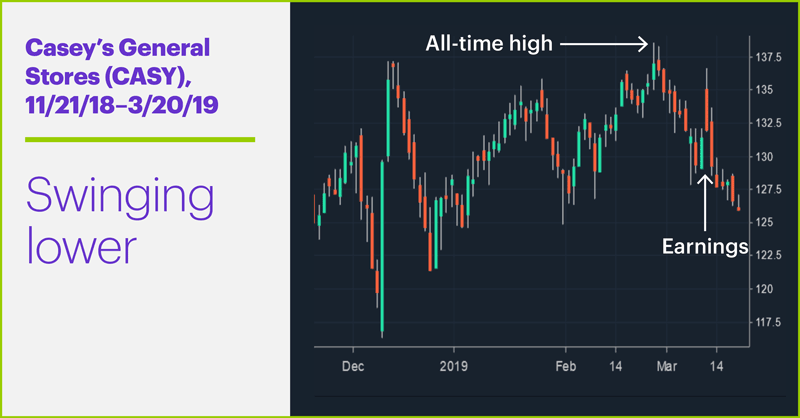 May WTI crude oil futures topped $60/barrel yesterday for the first time in more than five months, pumping up energy stocks in the process. Today’s numbers (all times ET): Bank of England announcement/minutes (8 a.m.), Leading Indicators (10 a.m.), EIA Natural Gas Report (10:30 a.m.). Today’s earnings include: Carnival (CCL), Conagra (CAG), Darden Restaurants (DRI), G-III Apparel (GIII), Jefferies (JEF), KB Home (KBH). 1 StreetInsider.com. Casey's General Stores (CASY) Tops Q3 EPS by 21c, Revenue Misses. 3/11/19. 2 TipRanks. Analyst Price Targets. 3/20/19. 3 MarketWatch.com. Levi Strauss to offer 36.7 million shares in IPO priced at $14 to $16 each. 3/11/19.